I'm a semi-organized person, but you would never be able to tell it from looking in my purse, which happens to be a black hole of some sorts. Want proof? Try calling me. Even though there is a pocket on the inside of my purse just right for holstering my phone, it never goes there. So instead of answering calls promptly, I spend most of my time blindly fumbling for my ringing phone only to never find it in time. I had a little fun on Picnik! *my Clinque bonus buy collapsible hair brush w/mirror-totally more useful than I thought it would be. *My date book which rarely gets used past February and mostly houses old receipts and other misc. paper goods in my purse. 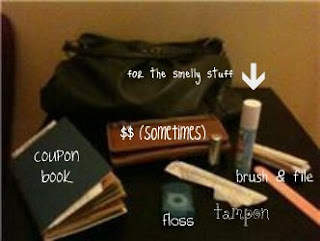 What do you carry in your purse that is "out of the ordinary"? How about your "must-haves"? Link up with us over at Working Mom Wednesday! ha sounds like you need my purse, it's not pretty but is organized! hahaha I have the exact same problem with finding my phone in my purse - even though I usually put it in the same pocket every time!! I think purses are black holes too! i have a pocket on the front for my phone. i try to use it, but i end up putting other stuff in there. then, i can't find my phone. Love your purse, and I'm impressed with the labels. This was a really fun prompt. Happy WMW (sorry I'm late)!